On June 1, 2016, John Deere announced some significant updates to the 2017 line of T670 Combines that aim to increase productivity and reduce maintenance. Not only are these changes expected to help increase grain harvesting productivity and efficiency, but they will also help farmers achieve better grain and straw quality. For this reason, we wanted to provide a brief overview of the new John Deere T670 Combine to highlight which features we are most excited about. Let’s dive right into some videos! 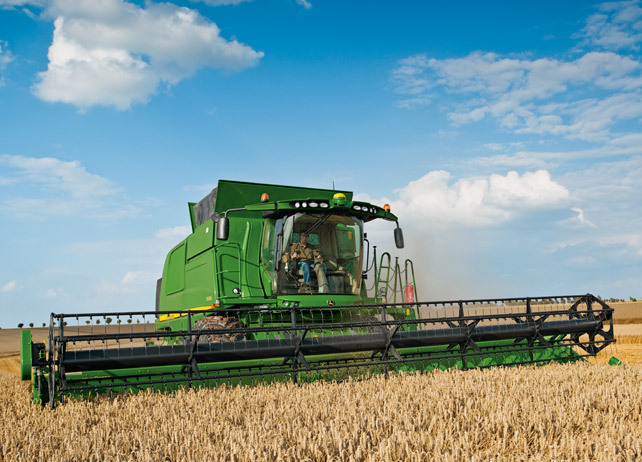 Some of our favorite features of the John Deere T670 Combine are the Large Active Separation System for managing an even crop flow, the quick engage booster bar, the easily adjustable Dyna-Flo Plus cleaning system, and the extra fine-cut straw chopper for excellent chopping quality and distribution. It’s one thing to read or hear about these features, and another to actually see them in action. This video offers a quick view of each of these key features in the T670 harvesting system. Enjoy! What’s the new Dyna-Flo Plus Cleaning System in the T670 Combine all about? Feeder augers, a dual-speed fan for better air flow, effective pre-chaffer, aerated drops and sieves and the largest sieve surface on the market! Don’t believe us? Watch this video to see the Dyna-Flo Plus Cleaning System in action. As we’ve seen, there’s a variety of exciting features in the updated T670 Combine. But, we can’t forget about the Interactive Combine Adjustment (ICA), which optimizes the adjustment of the combine harvester. If there is too much chaff in your grain or you’re experiencing excessive crop losses, it’s important to define your priorities for the threshing process. For example, reducing separator losses or a cleaner grain tank. The Interactive Combine Adjustment will suggest settings for you to help optimize productivity and will automatically apply these settings after you have confirmed them. Various optimization targets are considered and the combine harvester adjusts accordingly. See for yourself how the Interactive Combine Adjustment system can maximize combine productivity. We hope you enjoyed this post and now have a better understanding of all that the model year 2017 John Deere T670 Combine has to offer. If you enjoyed this post or want to read others, feel free to connect with us on Facebook, Twitter or Google+!